One great option to consider for a delicious barbecue is the Char Broil TRU Infrared Kettleman Charcoal Grill. This particular model has been gaining a great reputation so far among users. In this article, we will find out if it is all that it has been cracked up to be. Here, we will look over the specifications, advantages, disadvantages along with the consumer reviews from the customers who have already purchased and used this grill to get a better idea if this grill is best for you. The Char Broil Kettleman is a round grill with 360 square inches of cooking area. The durable, no-fall-through cooking grate is rust resistant and porcelain coated. This way, it can withstand the high temperatures without losing its shine. Moreover, the cooking grate distributes heat evenly and prevents flare-ups. As for its infrared technology, this is exactly what allows the heat to move evenly preventing cold and hot spots in the meat you have grilled. Users can conveniently control the temperatures inside thanks to the vent on the lid that opens and closes. On top of that, the hinged lid grants the added benefit of focusing only on tending to the food rather than where to place the lid while you cook. Speaking of the lid, it also has a latch so that it can be locked while you slow cook or smoke your meats; and so that it does not move while the grill is being transported. 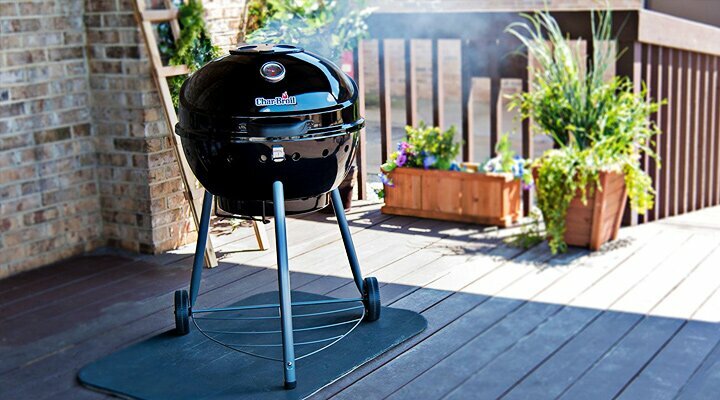 The Char-Broil TRU Infrared Kettleman Charcoal Grill has two wheels for greater mobility. A shelf underneath allows for more stability for the grill and extra storage area. The slide-in removable ash bowl simplifies the cleanup process. All in all, this charcoal grill offers a pleasurable experience for an outdoor party with delicious stakes and vegetables. Customers were delighted with their Char-Broil TRU Infrared Kettleman Charcoal Grill. Most of the reviews of this grill spoke very highly of it stating that it cooked their meats to perfection. Many said that their steaks tasted the same as the steaks that high-end restaurants often serve. The Char-Broil TRU Infrared Kettleman Charcoal Grill cooks at a very high temperature without burning the food due to its control of flare-ups, which was another commonly mentioned benefit to this grill. Though there were comments concerning the fact that this grill does not perform as well in the area of slow-cooked or smoked meats, it received excellent reviews for seared meats that maintain moisture and juiciness on the inside. There were a few reviews from customers who complained about the long process of thoroughly cleaning the grates. However, these complaints were in the minority as compared to customers who were very happy and satisfied with their purchase. One of the other obvious benefits to this grill was found in the price. For all that this grill can do, the price is okay despite its consistently high-quality cooking action. Overall, the comments for the Char Broil TRU Infrared Kettleman Charcoal Grill were overwhelmingly positive and are clearly tipping the scale in favor of this grill. You are sure to be impressed with the purchase of the Char Broil TRU Infrared Kettleman Charcoal Grill. The Char Broil TRU Infrared Kettleman Charcoal Grill is a wonderful grill that is almost guaranteed to satisfy the griller in your family with the high quality, great tasting meats that it can produce. At an amazingly affordable cost, there is not much reason not to give this grill a try. Innovative components like its infrared heat distribution consistently produce great tasting food that everyone at the barbecue will enjoy. The Char Broil TRU Infrared Kettleman Charcoal Grill has all bases covered when it comes to pleasing even the pickiest foodies. This looks like a good grill. The vent on the lid would make it really easy to control internal temperatures, and infrared heating will make sure everything heats more evenly. I haven’t yet owned a grill with infrared heating so I can’t say how good it is yet. What’s interesting about this Kettleman grill is that you can level up your barbecue cooking to 550 degrees. That’s a rare event among grills. That’s because the infrared technology heats not only the meat, but also the air around it. Usually, people choose an infrared grill for their searing meals. Hope this helps!